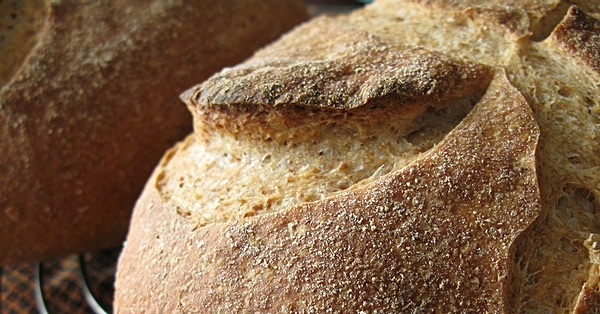 Sourdough — whatever you call it — is the original leavening agent for breads around the world. At its simplest it is just a piece of the last batch of dough, set aside to ferment the current batch. But it can be so much more than that, a stable little ecosystem of species that support one another while keeping out intruders. It also makes the best bread, although I admit to being biassed. Photo is one of mine, in both senses. I sometimes send a link on my newsletter. @glennabeatrice I had not seen it that way, but yes. @hotscotchoven out of the oven etched with a smile! Just like vinegar—mine was given me 30 years ago and was 75 years old at the time and is now…well, 105 years old, give or take. The ‘mother’ is still part of the original mother but then again, if the hammer head is changed and then the baton is changed to fit the hammerhead, is it the same hammer? My “mother” is actually the same, traveling many miles in many countries to be in my cave here in France. I would love to know more about your sourdoughs starters. Yes! It is the same, and it is also different. Maybe I will write a bit more about my starters when this is all over. Marina Buening liked this article on instagram.com. Helen ‘Sanderson’ Keating liked this article on instagram.com. Bakeshop liked this article on instagram.com. Luigi Guarino mentioned this article on agro.biodiver.se. Jennifer Wilkin Penick liked this article on instagram.com. Spannocchia liked this article on instagram.com. Mark & Grace liked this article on instagram.com. blackberries and i liked this article on instagram.com. Alice Kiandra Adams liked this article on instagram.com. takomamama liked this article on instagram.com. John Gonzales liked this article on instagram.com. At Melissa’s B&B liked this article on instagram.com. Eric Helmuth liked this article on instagram.com. Sigurd Urdahl liked this article on instagram.com. domenicacooks liked this article on instagram.com. Shaun Mcdermott liked this article on instagram.com. Sarah Morelli liked this article on instagram.com. VineyardBaker liked this article on instagram.com. blacksmith’s breads liked this article on instagram.com. Layla Daoud liked this article on instagram.com. It needn't actually taste sour. In fact, except in a few countries, it need not even make use of a natural leaven.